This book is a collection of expressions, along with comments on their origin, and excursions into Korean history, folk tales and contemporary culture. It leaves out many idioms, but aspires to reflect part of the Korean character through the humor and imagery of language. Some expressions are used mainly by older people. There is also slang that is popular only among the young. A lot of terms in this book illustrate the gritty side of Koreans, who have endured conflict and hardship. 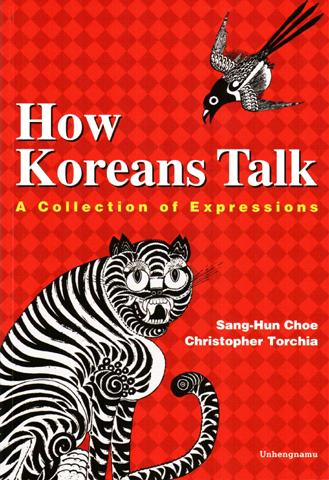 A handful of expressions are improper in a formal Korean setting, but they were included for their historical and cultural backgraound. 우리말 표현과 그 표현의 발음을 로마자 표기에 맞게 적고, 그 표현과 같은 의미의 영어 표현을 크게 적어줌으로써 외국인이 쉽게 이해할 수 있게 했다. 그리고 각 표현마다 시사적인 예와 전통적인 예를 들어가면서 의미를 설명했다. 부연 설명이 필요한 것은 별도로 박스 처리를 해 이해를 도왔다.